This post is sponsored by Fresh Baby. All opinions are my own. We all know I am a baby food making convert. In my post on making baby food, I share how I was scared to make baby food because of something I read in What to Expect the First Year. But when Kaitlyn was close to a year old, I saw lots of blog readers made their own food, so with McKenna, I made her baby food. I loved it! It was easy and I will never go back. Well, that pretty much removes any problems for pretty much everyone who is hesitant to make baby food, right? I don’t think (I may be wrong) that anyone disagrees that making baby food is better than buying it commercially. I think we have all come to the realization that fresh food is better than pre-made store bought food, whether for you or your children. It also tastes MUCH better. Let me tell you, I can’t really eat store bought baby food. But I can eat the homemade baby food–no problem. Let me also just interject a side note to remind you that I am not completely opposed to store bought baby food. McKenna has had it. Sometimes it is great (like if you are traveling and don’t want to worry about keeping the pre-made stuff cold enough). But my preference is definitely home made. So, people either don’t make it because they are intimidated (HARD) or think it will be time consuming. I have told you before that making baby food is easy. Readers have commented on that agreeing that it is easy, many of them sharing that they themselves are no cook, but can make baby food. Now we have a kit before us that declares you can make it easily. Let me tell you, I love this kit. This method is similar to the Super Baby Food method in that they use ice cubes freezing method. You make the baby food, then put it in the ice cube trays to freeze. Then you transfer cubes to the freezer storage method of your choice. These trays are nice because they have the covers. Covers aren’t a necessity, but they are really great when you want to stack them up. And, let’s be honest, sometimes you forget about the tray for a day or two or just are so busy it seems a low priority, so the lids are nice for helping keep the cubes fresh. This was a pleasant surprise for me. I love information, and I love easily accessible information. This is a laminated card with some quick reference info. It lists 10 Healthy eating habits. It has a table for common baby ailments and the foods to eat and avoid. Does your baby have diarrhea? It lists the foods to avoid as well as the foods that help. What about a runny nose? List for that. It even lists foods that help baby sleep better. It also lists the best source for certain nutrients. Are you concerned about your baby’s protein intake? This quick reference table lists foods that are great for protein for baby. We flip the card over and see a step by step guide for what to do if baby is choking. This is nice. My friend, who works in the medical field, was just commenting last week how she doesn’t know if she would remember exactly what to do in an emergency situation. So if you had this card close to your baby’s highchair, you could grab it and know exactly how many back blows and chest thrusts to do. It also has a list for making baby food, along with a list of how to thin, how to thicken, and good foods to mix together for variety. The final thing on this chart is a table of first foods by age. I think this is the real gem of the kit. We all know how I love information. I think to call this simply a “cookbook” isn’t doing the book justice. First of all, the book is hardback, but also spiral bound. My preferred book cover in life is hardback of course. This means longer life span. The spiral binding is perfect because it stays open on your counter. Now, let’s highlight some great sections (this is not every section, just some of my favorites). The book has a place for some photos, along with your baby’s first foods, favorite foods, food milestones, and a list for food reviews. I thought that was fun. There is a section on instilling healthy eating habits, a section on benefits of homemade baby food, a section on introducing solid foods, and a section on creating a balanced diet (dietary essentials). There is of course also a section on how to make baby food. I think it is important to note it is only three pages long. It is comprehensive, but not verbose. It gives you the info you need. I think that is an important step in making the process “easy.” Then there is info on serving the food. There is also a “to go” section that I think is fabulous. It lists the different places you might go and what you need to take with you to feed baby. There is even a checklist in table form at the back of the chapter so you can quickly look and make sure you have everything you need. There is also a time management section. Now for the cook book section. There is a separate page for each food. Each page includes how to select, how to store and ripen, how many to buy, how to cook, how to store, and how to serve. It also has a list of foods that go well with that food so you can mix it up for baby (once both foods have been introduced). It also has a list of spices that are good with that food, and a list of the nutrients in that food. With each spice, it tells you what age it is safe and what age you introduced it. It also has a list by the food combos where you can note if baby liked that or not. At the bottom of the page, you can note the date you introduced the food to baby and any notes you have about it. Oh, and it also gives you how much prep time each food takes. What a great book. This book is so easy to read and very easy to scan. It is full of tables and bulleted lists–I love bulleted lists. Very user friendly. This adds to the “easy” factor. Okay, but not everyone is a “learn by reading” type, right? This DVD is a short 22 minutes long. 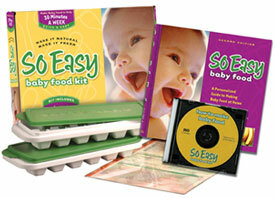 It tells and shows you the basics of what you nee to know about feeding your baby. This is great for those who are intimidated by the process and/or those who learn best by watching and listening. So there you have it! It is a great kit. And Fresh Baby is giving one kit away to a lucky winner! Ready to enter? Here we go. Oh, wait, as a side note, they also have a Toddler cookbook, which I haven’t tried, but plan on checking out after seeing the baby cookbook. “Like” Fresh Baby on Facebook. Once you have done so, come back and leave a comment saying you are a fan. I “like” Fresh Baby on Facebook! Follow Fresh Baby on Twitter. Once you have done so, come back and comment saying you have done so. I am following Fresh Baby on Twitter! Go to both the Fresh Baby website and the Fresh Baby blog and look around. Once you have done so, come back and tell me so. Change your status on Facebook to talk about the giveaway with a link to this post. Leave a comment saying you did so. You don’t have to do all seven entries…for example, if you just want to follow Fresh Baby on Twitter but don’t want to enter through the other methods, you can just do entry three. Entries will be accepted until 11:59 PM Sunday, August 1 Mountain Standard Time. The winner will be announced Monday, August 2. Previous Post Last Weekend to Enter to Win SunuggleU! I "like" Fresh Baby on facebook! I looked around the blog and website! I am now following Fresh Baby on Twitter! What great resources for a new mom like me! I checked out the Fresh Baby website and the Fresh Baby blog. Definitely following the blog for future recipes! I am following Fresh Baby on Twitter. I looked around the website and the blog. I liked free baby on facebook. I looked around on the blog & website! I looked around the website! I checked out the FB website and blog. Now I'm ready to buy their book for Toddlers! I'm following FB on twitter! My FB status links to the giveaway! Changed my FB status :Fresh Baby – Giveaway … and check out the website: http://freshbaby.com/♥ making Alekzander's baby food … ♥ new resources … and free stuff?! I'm following Fresh Baby on Twitter! I'm a follower! I made baby food with my first, it's great!! I looked around their website & blog! I just want to say that we raise chickens, turkeys, and lamb on pasture for sale directly to consumers and have an 11-week-old. Making her baby food will be right in line with our philosophy of eating local and natural!! I'm a follower…and let me just say how much I LOVE your blog!!!! I looked around the blog and website…good stuff! I like Fresh Baby on Facebook! I looked around the Fresh Baby blog and website…. what a great resource! I'Ve Looked around and already learnd some cool stuff. i have this kit, whoever wins is one lucky person! it is AWESOME! I "like" Fresh Baby on Facebook. I changed my status on facebook. I looked at the Fresh Baby website and blog! I looked around the website and blog. I'm a new follower and fan on FB, I also looked around, thanks! I "like" Fresh Baby on FB! I looked around the website & the blog.